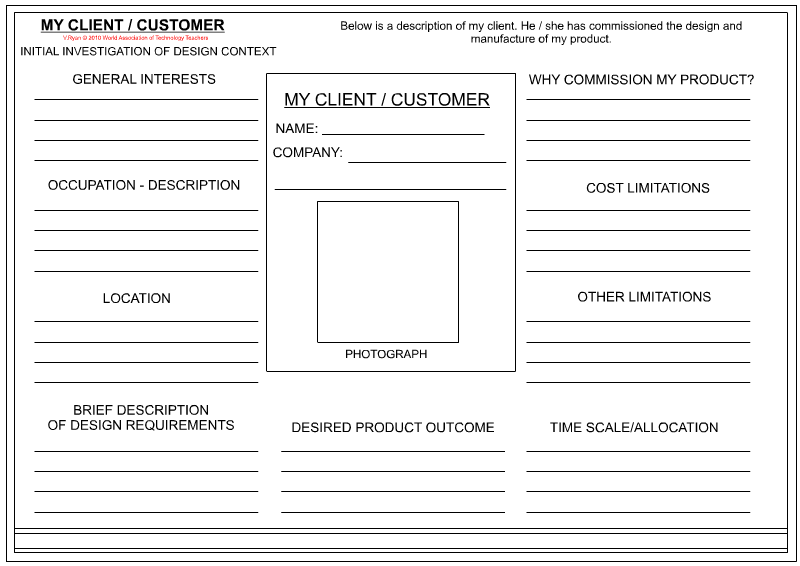 A very important aspect of any Product Design folder is a sheet that clearly identifies the client. This is normally the person who has commissioned you with designing and making a product. It will probably be the person you are design for, such as a customer. 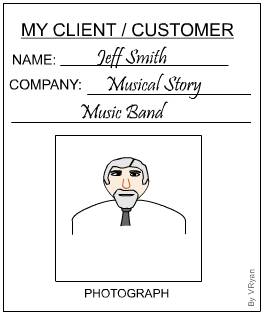 On the Client Profile sheet you need to include some details about your customer. An example is seen below and includes suggested subtitles to a variety of short sections. 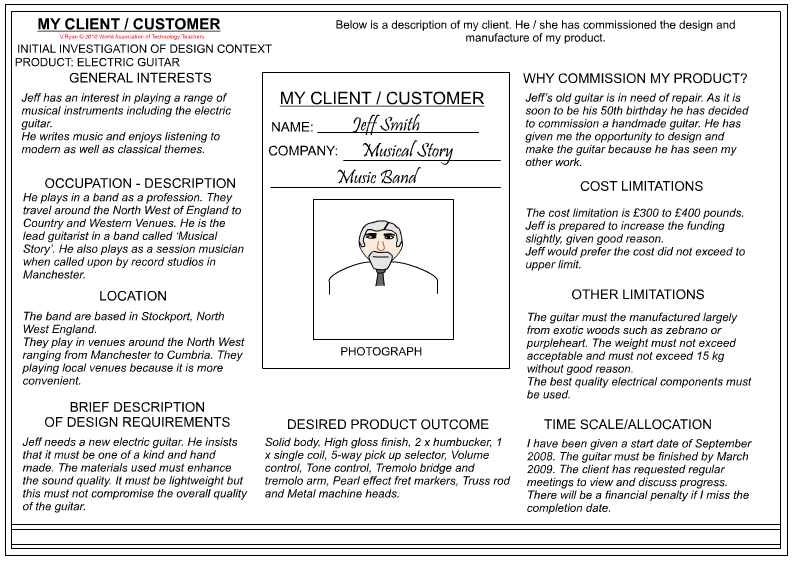 The client is a professional guitar player who needs a special, individual, hand made guitar. Jeff has an interest in playing a range of musical instruments including the electric guitar. He writes music and enjoys listening to modern as well as classical themes. He plays in a band as a profession. They travel around the North West of England to Country and Western Venues. He is the lead guitarist in a band called ‘Musical Story’. He also plays as a session musician when called upon by record studios in Manchester. The band are based in Stockport, North West England. They play in venues around the North West ranging from Manchester to Cumbria. They playing local venues because it is more convenient. Jeff needs a new electric guitar. He insists that it must be one of a kind and hand made. The materials used must enhance the sound quality. It must be lightweight but this must not compromise the overall quality of the guitar. Jeff's old guitar is in need of repair. As it is soon to be his 50th birthday he has decided to commission a handmade guitar. He has given me the opportunity to design and make the guitar because he has seen my other work. The cost limitation is £300 to £400 pounds. Jeff is prepared to increase the funding slightly, given good reason. Jeff would prefer the cost did not exceed to upper limit. The guitar must the manufactured largely from exotic woods such as zebrano or purpleheart. The weight must not exceed acceptable and must not exceed 15 kg without good reason. The best quality electrical components must be used. I have been given a start date of September 2008. The guitar must be finished by March 2009. The client has requested regular meetings to view and discuss progress. There will be a financial penalty if I miss the completion date. Solid body, High gloss finish, 2 x humbucker, 1 x single coil, 5-way pick up selector, Volume control, Tone control, Tremolo bridge and tremolo arm, Pearl effect fret markers, Truss rod and Metal machine heads.